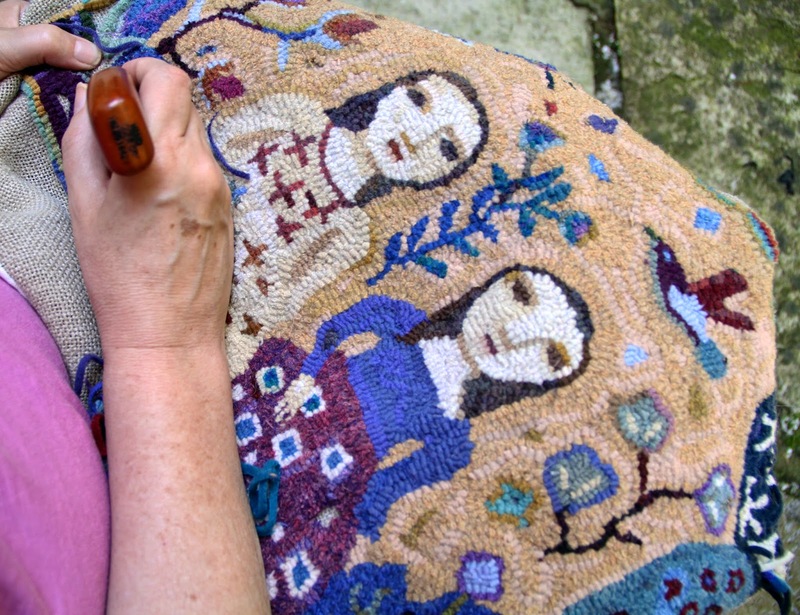 I have picked up my rug hooking again. Almost done with this piece. The colors in this pic are a bit off, or maybe it's my monitor. And I have been working on some other projects too, which I will post pictures of soon. I have just visited with my mom who is 87, and spent time in June with Bruce's parents (who are 87 and 92). All of these elders are beset with daily challenges but their minds are still lively, and they are still engaging and full of humor. My house is always fuller after a visit. I am inheriting all their unfinished projects, to add to all my own. Lots of snippets of fabrics, bits of this and that. (No wool, sadly). But there is a lesson in there somewhere. I have boxes to go through, decisions to make. It's hard, as someone who loves to make things, to assess these projects and decide what I will actually use and what I should pass on. I enjoy your work and your written voice. Glad that you find pleasure in spending time with your mom and in-laws. My own mama passed away 2 years ago next month. She was 94 and spicy until the last drop! Thanks Christine. I love how you describe your mom as "spicy until the last drop". You must miss her a lot. My dad passed 8 years ago and I still miss his sweetness.